Düsseldorf - Fortuna Düsseldorf picked up their first home win in the Bundesliga in over 15 years to climb out of the bottom three with a 2-0 triumph over Hamburger SV. 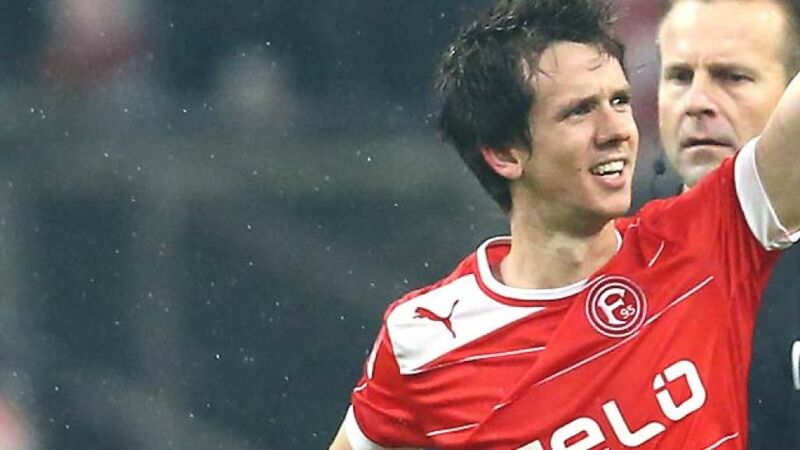 Robbie Kruse put the hosts in front in first-half stoppage time after Hamburg lost their influential midfielder Rafael van der Vaart to injury. Stefan Reisinger then sealed the win only minutes after taking to the field in the 63rd minute to earn Norbert Meier’s side their first home win of the campaign, and their first since returning to the big time last summer. Yet to win at home following their return to the top flight, Fortuna appeared keen to ditch that negative statistic under the floodlights, and rain, at the ESPRIT Arena. Hamburg arrived in typical away-team mode, sitting back and defending for much of the first half, although Fortuna were unable to make the most of their extensive periods of possession with Rene Adler pouncing on the one loose ball inside his penalty area in the 13th minute. On one of Hamburg’s rare forays forwards, Marcus Berg sent Rafael van der Vaart’s cross over the bar. Van der Vaart’s evening would come to a premature close shortly after as he pulled up holding his hamstring. With the Dutchman limping off, Hamburg not only lost the brains behind their game, but seemingly also their belief. The visitors did have a goal disallowed in the 41st minute when Michael Mancienne tucked the ball in after Berg’s header had been saved, but the English defender was denied his first Bundesliga goal by the offside flag. It was a telling moment for HSV, who went close again through Maximilian Beister's left-foot shot moments before the hosts took the lead. Andreas Lambertz sent Kruse through and the Australian threaded a shot inside the near post, thanks also to a deflection off Mancienne which left Adler helpless. The anticipated reaction from Thorsten Fink’s men failed to materialise in the second period and, instead, Fortuna gained more and more control of the game. Hamburg had their second goal of the evening disallowed in the 55th minute when Heiko Westermann’s free-kick was deflected in off Kruse, Berg having used overly-robust means to make room for the shot. Reisinger was brought on for Garbuschewski approaching the hour and the former Freiburg man scored just five minutes later, leaving two Hamburg defenders for dead as he burst into the penalty area before scooping his shot high into the roof of the net. A miss from Artjoms Rudnevs moments before the final whistle summed up Hamburg’s evening as they became the first side to come away from the ESPRIT Arena empty-handed this season.